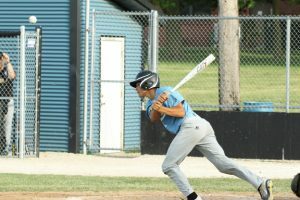 The Lynnville-Sully baseball team faced a wide spectrum of teams in the past week, leading to a couple of close games as well as a couple of 12-plus run victories. 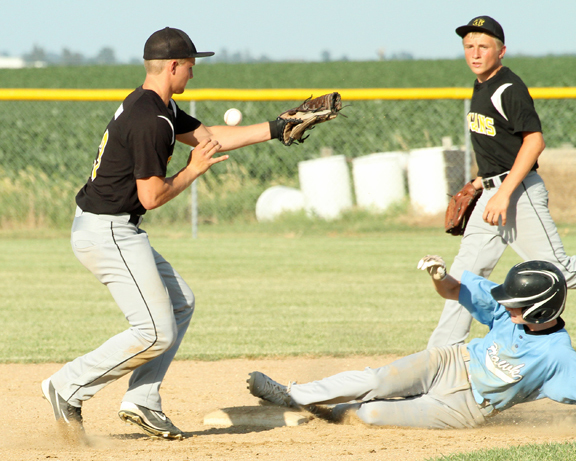 The Hawks almost erased a seven-run deficit against West Marshall on Tuesday, June 13. But in the end, the L-S boys came up just short in the home game with a final score of 7-6. The game got off to a slow start with neither team scoring in the first two innings. West Marshall rounded up four runs in the third and three runs in the top of the fifth. Going into the bottom of the fifth, the Hawks were behind, 7-0. L-S brought five across home plate in the bottom of the fifth and went into the sixth inning trailing by two, 7-5. The Hawks played tough defense and did not allow West Marshall another hit. In the bottom of the seventh, the L-S boys scored one and put two more on the bases. They weren’t able to reel in another run to tie the game, losing 7-6. The Hawks only had four hits against the Trojans and one stolen base. Senior Tyler Van Zante pitched the first six innings. He allowed nine hits, walked two, and struck out seven. Freshman Blaize Kuhlmann finished off the final inning, striking one out. The JV boys also had a tight game with West Marshall and came out on top, 5-4. The Hawks scored all five runs in the bottom of the third inning and then shut down West Marshall for the win. Junior Cody Gibbs; freshmen Kinnick McFarland, Slater Young, and Skyler Jannenga; as well as Kuhlmann all reached base and scored for the Hawks. McFarland earned the win from the mound. The next day, June 14, L-S traveled to North English to face the English Valleys Bears. The Hawks played solid defense, winning the game, 14-1. The Bears got their single run in the bottom of the first, after the Hawks had scored three. L-S kept rolling, scoring in all innings except the third. Senior Caden Dunsbergen went three-for-four at bat, which included a double. He stole four bases and had one RBI. As a team, the Hawks had 12 hits, pounding out seven doubles. Once on base, L-S stole an impressive 13 bases. Senior Isaac Collins came away with the win, pitching all seven innings. He only allowed six hits and struck out four. Junior Carson Dunsbergen sends the ball flying in the 20-8 victory over Tri-County last Friday in Sully. The Hawks got the job done early on Friday, June 16. L-S face the Tri-County Trojans and walked away with a high-scoring win, 20-8. The Trojans took an early 1-0 lead, but L-S quickly changed that around, scoring four runs in the second inning. Both teams kept fighting, with Tri-County scoring another run in the third and six runs in the fourth. The Hawks weren’t shaken, though, bringing home two in the third and a whopping 14 in the fourth, ending the game. The Hawks hit 0.480 for the game, going 12-for-25. Junior Elijah Collins went three-for-four, hammering out a double. Junior Corbin James had hits all three times at bat, scoring twice and bringing in three RBIs. Freshman Bray Noun Harder got on base all four at-bats and stole three bases. L-S was able to steal 10 bases in only four innings. The Hawks burned through three pitchers: E. Collins, junior Josh Dunsbergen, and Kuhlmann. They totalled three hits, six errors, seven walks, and eight strikeouts. L-S took down the conference leader, Colfax-Mingo, 2-0. This avenged a 1-0 loss from Colfax at the beginning of the season. In the low-scoring game, L-S was able to bring one home early, scoring once each in the first and third innings. “Offensively, the key was we strung our hits together to push runs across the plate,” commented L-S Head Coach Bob Scandridge. Collins and Van Zante both went two-for-three, and each had an RBI. Caden Dunsbergen had the only stolen base of the night. The Hawks not only had a solid offensive game, but an impressive defensive game as well. “We played outstanding defense tonight to back up Tyler's strongest pitching performance of the year,” noted Scandridge. Van Zante pitched all seven innings and only allowed one hit from the Tigerhawks. “Tyler was very efficient with his pitching, getting ahead of the batters all night,” added Scandridge. Van Zante only walked one batter all night and struck six out, ending the game with a strikeout. The L-S boys are now 11-5 on the season with their only conference losses so far being to Colfax-Mingo back in May and to Iowa Valley on June 12. “Big win for the kids tonight because this puts the Hawks into a tie for the conference lead. We have a lot of baseball left, and we need to finish strong down the stretch,” Scandridge closed. The Hawks have three games to come this week, traveling to Montezuma on Wednesday, June 21. The following day, L-S will have a long drive up to Conrad to play BCLUW. They close the week hosting the Warhawks of North Mahaska on Friday, June 23, which is “Pack the Stands” night. L-S and North Mahaska fans alike can come to the baseball and softball games that night free of charge.